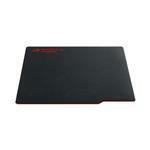 A rollable, silicone-based mouse pad for smooth, precise, and silent control. - Durable, odorless, and washable non-slip silicone base. gives you silent, swift and pixel-precise control, and super smooth glide. The surface works perfectly with both laser and optical sensors. hybrid design boasts exceptional durability, making it ideal for you to take to LAN parties. for easy cleaning and long lifespan. enables you to game with comfort through the most intense battles unscathed. provide smooth, rounded fray-resistant edges and exceptional durability. grips firmly onto any surface. It doesn't slip, so you won't either. Prior to production, the materials that make up ROG Whetstone are subjected to the strictest material selection and manufacturing processes. ROG even received input from the world's finest professional gamers, and had them lab test hundreds of materials before deciding on the final design. The resulting product is bluesign®-certified, and meets the world's most stringent safety and eco-friendly production requirements. ROG Whetstone is a premium, high quality product that's good for you, as well as the environment. A whetstone is a stone used for sharpening knives and other cutting tools. In the gaming world, deft, precise control often makes the difference between victory and defeat. Having a high performance gaming mouse isn't enough, ROG Whetstone is a gaming weapon that gives you the edge for ultimate performance.